Ask any hipster on their fixie or yuppie in their loft what they like about Portland and you’ll hear about food carts, coffee, microbrews, and mountain or ocean access within an hour’s drive. What’s often missing is any mention about the city’s boatability. Portland is not just the shining mecca of hipsterdom, it sits at the confluence of the Willamette and Columbia rivers. 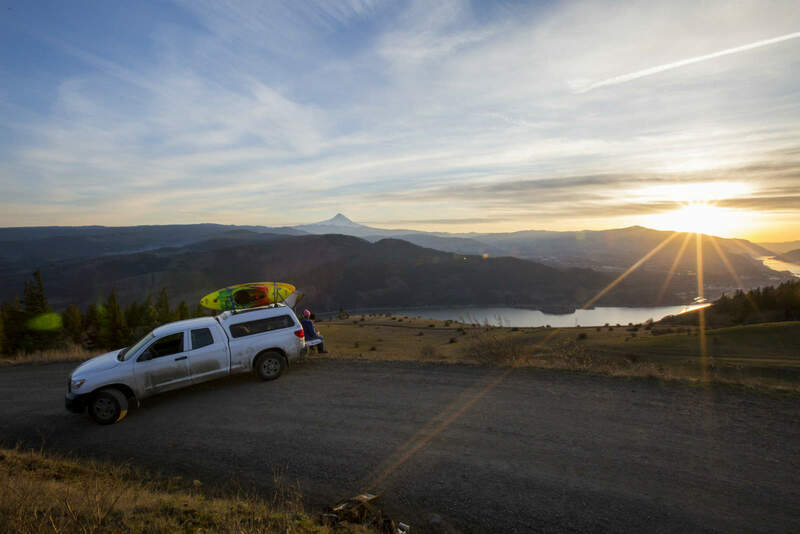 The majority of the West flows past Portland: Year round whitewater rocks the Columbia River Gorge and within city limits you can paddle to uninhabited islands, sandy beaches, industrial sloughs, and the largest waterfall by volume west of Niagara. 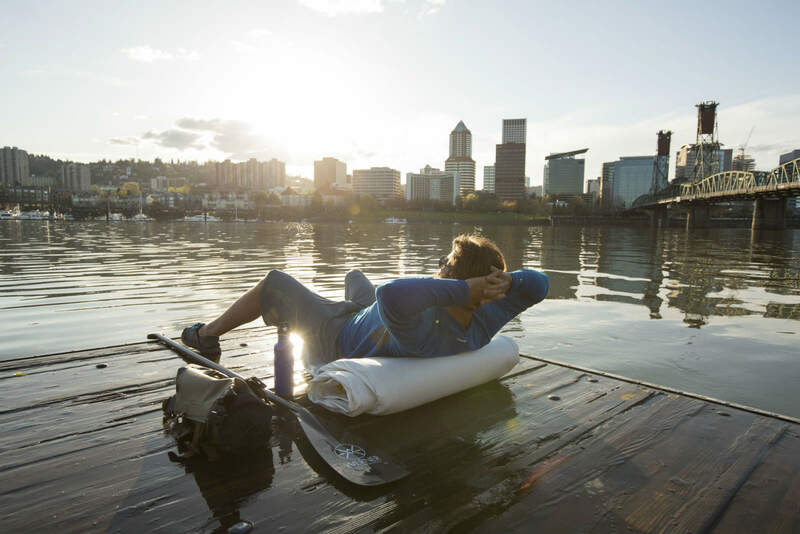 If you’re in town for the weekend, head over to the Portland Kayak Company. 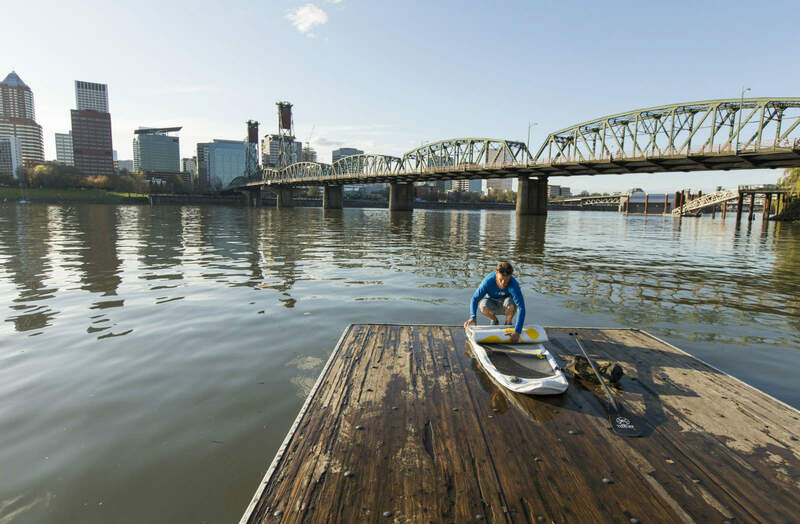 They can hook you up with a kayak or SUP for Willamette excursions at their doorstep. The five-mile Ross Island Loop is the perfect intro to Portland paddling. Downtown skyscrapers dominate the view, but as you wrap around Ross Island you might spot a bald eagle or see a beaver swimming from Oaks Bottom. You’ll get the natural view of the city, and possibly need to practice your brace stance on motorboat wakes as they cruise past. If you live in a Craftsman bungalow or a Mississippi Street studio and are looking to buy, then try Andy and Bax. This is the shop for rafters. Their upstairs is a military surplus store, but their basement boat department is filled with all the goodies: rafts, drysuits, coolers, and pumps, and badass photos of local boaters pulling harebrained stunts hang on the walls. If these guys can’t help you, then you’re likely beyond repair. To up your river game, the spot for instruction is Alder Creek Canoe and Kayak. They host a range of classes from whitewater 101 to rescue clinics. They also host a variety of events to meet other paddlers, get beta on trips, or find new river partners. They’re the indispensable pulse to the Portland boating community. They also have a huge warehouse and rental fleet of rafts, kayaks, SUPS, and more. Once outfitted and informed, here’s the scoop on the places you need to know. 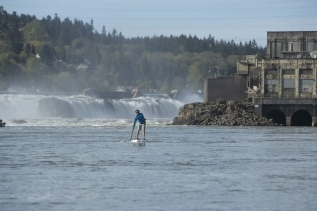 Willamette Falls is actually in neighboring Oregon City, just south of Portland city limits. So on your way out of town, stop in at Water Avenue Coffee. Their coffee will satisfy the most discerning drinker, and the egg sandwich is the perfect fuel for your day. Willamette Falls is 40 feet high and is only trumped by Niagara Falls as the largest volume waterfall in the United States. The major difference is hardly anyone knows about it. The site is difficult for the public to view because since the 1880’s power companies and paper mills have industrialized the site. This two-mile tour is best suited to SUPs or kayaks and is equally steeped in natural drama as it is historic. Eerie industrial buildings rise from the swirling pools beneath the falls. Most are abandoned glorifications of the industrial era, but before then, Oregon City was the end of the Oregon Trail. The short jaunt to the base of the falls makes for an incredible window into the past, but it’s also an insight into the future. 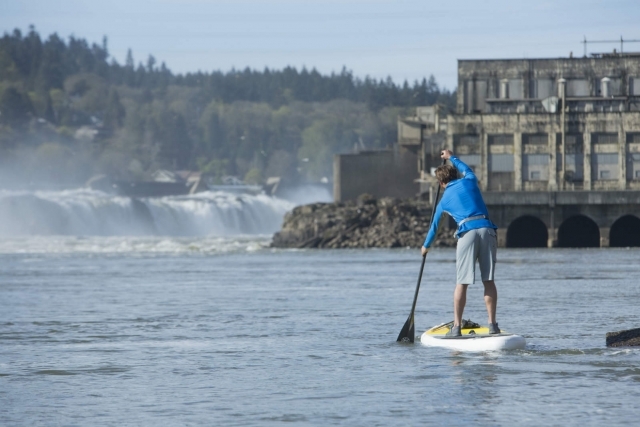 All of those derelict walkways and mill towers on the waterfront are slated for a redevelopment project that showcases Willamette Falls for the natural wonder that it is. The Columbia Slough is a 19 mile industrial waterway in north Portland. It will never earn Wild and Scenic designation, but it’s still fascinating. The Slough is created by a system of levees that control the largest interurban wetland in the country, Smith and Bybee lakes. You can bite off the whole thing at once or paddle it in sections. It goes past the airport, warehouses, huge grain elevators, golf courses, and beneath many roads. The Slough is the only waterway I know of where you can paddle upriver both ways. Every four hours the current reverses because of its tidal influence even though it’s 100 miles from the Pacific. Stand up paddleboards, canoes, and kayaks are all suitable for the Slough. Due to industrial runoff, you might choose to avoid going for a swim. When you reach the Willamette at Kelley Point Park there’s a sandy beach where you can scope the enormous freight ships coming in from across the globe. Stop in at Breakside Brewing after your outing. Order the flagship IPA to taste why it’s perennially voted one of the best beers in the world. The Columbia River Gorge is a kayaker’s paradise. There are seven quality rivers all within an hour’s drive. 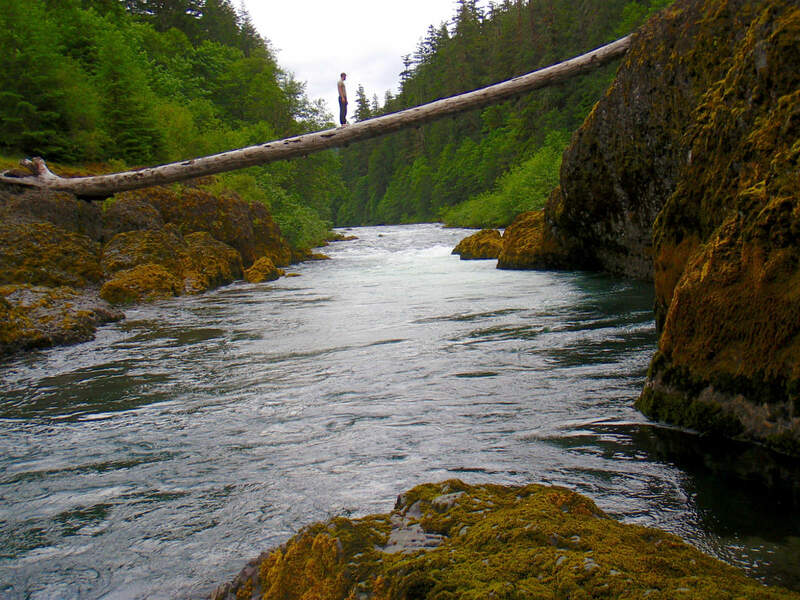 They feature waterfalls, gorges, and boulder gardens in classic Pacific Northwest forest. The glaciers on Mt. Hood and Mt. Adams keep the rivers pumping all summer long, while mild temperatures and lots of rain make winter boating a viable option. Perhaps no river in the gorge is more famous than the White Salmon. This river serves up fast, exhilarating sections that are stacked with fun rapids. BZ Corner to Husum Falls is the most commonly run stretch for rafters and kayakers, but the Little White Salmon is one of the best technical Class V creeks in the Pacific Northwest. The Wind River is another Class IV river that will test the mettle of expert kayakers and rafters. After an intense day, the Wind has riverside hot springs to soothe your nerves. There are also a number of top notch breweries to choose from in the area. Don’t miss Double Mountain Brewery in downtown Hood River. They brew strong beers loaded with hops and cook up gourmet pizzas. Once you start exploring the area, you’ll soon understand why The Gorge is the epicenter of the Northwest kayaking community. No river defines the Portland whitewater scene more than the Clackamas. The Three Lynx run is a 13-mile section that delivers pool drop rapids in a mountain canyon. Highway 224 leaves civilization behind as you enter Mt. Hood National Forest. The road follows the river for the entire stretch, making the rapids easy to scout, and access a no-brainer. The rapids are Class III-IV but are not to be underestimated. Toilet Bowl or Carter Bridge have waves that can easily flip a raft, while Hole in the Wall features a recirculating wave that’s a keeper if you go for a swim. 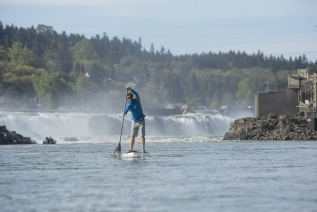 Each May Portland boaters of all types flock to the river for the Upper Clackamas Whitewater Festival. It’s the annual chance for boaters to compete head-to-head in derby races or the slalom course. The abundance of campgrounds makes for an easy weekend getaway. So after a good day on the river, you can stay, cook dinner on a campfire, and do it over again the following day. Don’t forget to bring a French press and a bag of Stumptown Coffee. They’re the beans that built the city’s caffeinated reputation. No matter if you live in town or are visiting for the weekend, Portland serves up more than just food, coffee, and beer. The immediate environs have enough paddling options to keep any type of paddler busy for years. What’s more, is that as you expand your range from Portland you’ll find that Oregon offers up some of the most diverse boating experiences in the country. From sea kayak tours, to multi-day desert floats, to raging whitewater in the wilderness. 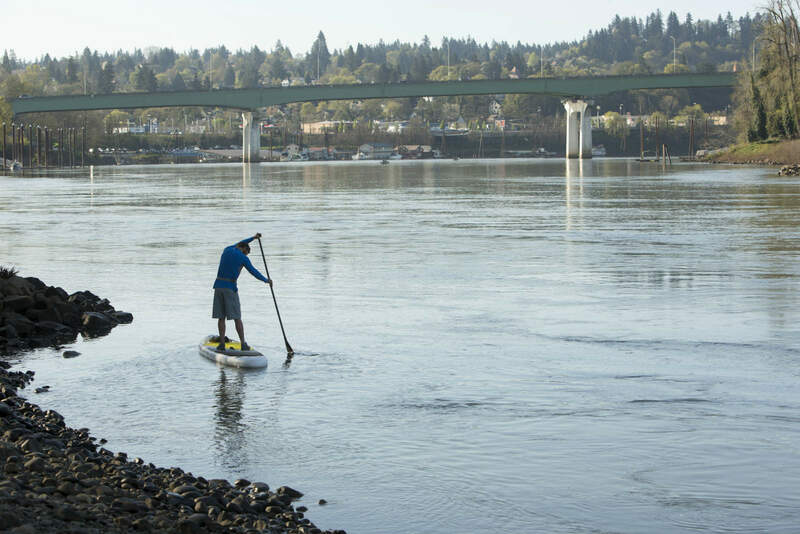 When it comes to boating, Oregon truly has it all, and if you like coffee, food, and beer, then there’s no better place to enjoy it than Portland.